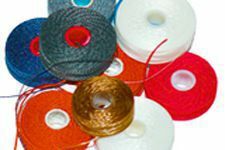 Style G bobbins are typically used in small and mid-sized commercial sewing machines for sewing garments, fabrics, leather, and upholstery. Style G bobbins are typically used in small and mid-sized commercial sewing machines for sewing garments, fabrics, leather, and upholstery. They are 0.390 inches (0.861 cm) high and 0.991 inches (2.187 cm) in diameter.